I read another wonderful post from the amazing Pernille Ripp the other day and that had me thinking. That is not unusual because all of her posts have me thinking at the end, but this one had me pushing back a little in my head, so I'm going to share it here. Pernille's post, Not Every Kids Wants to Learn How to Code, has some wonderful points that I cannot disagree with here. Pernille wrote, "not every kid wants to be a computer scientist." She is correct. Not every student wants to be a computer scientist. I would say that most students do not want to be a computer scientist. However, that is not why schools are teaching coding. There is so much more to it than that. I also agree when she wrote, "I wish that reading, playing music, creating, or anything else that seems to be so often on the chopping block was just as worthy as coding." Yes! I wish all of our students had more time and access to the things they are most passionate about at school. I want more money and time to help all of these students. I don't think it is fair to say we are cutting art for coding. It's not like coding came along and bullied art and took its place in line. I have been an advocate for the arts for many many years because I do know the value of them in our schools. I think there is room for all of them, but we might need to make room for one by cutting back on another. That sounds awful, but coding is important. As we move forward in life, certain things have become more complex than ever before. In Metro Detroit, you used to be able to leave high school and sign up with Ford and work the line. You would do that for 40 years and you would retire with a nice pension. Those days are gone. While some can still get a job in the manufacturing world out of high school, more and more of these jobs require more and more training. Are all of them code based? Of course not, but they are heavily tech based. To understand the tech, people need to understand how tech works. Tech works through code. While I do not expect all students to become Master Coders after some coding courses, I do think it is important for them to have the experience so they can have an understanding of how almost everything in the world works now. That exposure might lead them to a career in a coding related field, or they might just be able to troubleshoot some minor issues at their home. I liken it to learning a language. 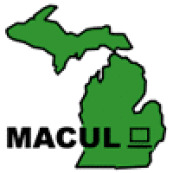 In Michigan, we require students to take 2 years of a language and recommend 3 for college bound students. Are we really expecting students to become fluent in three years of HS language? Are they going to become language teachers? Of course not, but they will have a better understanding of the language (coding is a language, many different languages) so they can interact a little better when they encounter it outside of school. I also do not think it has to be one or the other. Coding can, and should be, woven in to other subject areas. Coding in Art and Music makes so much sense! Learning the code for the various colors to show up on the display and create images using lines of code are completely possible. Adding music you record to that creation or music created without touching an instrument is possible. I'm not suggesting we abandon paints and violins, but there are ways to add in elements of coding to what we already do. My son, Leo, is turning 5 next week and he already has some experience with coding. He has been using Scratch for a few months and loves it. Does he understand that it is coding, no, but he is learning about he cause an effect relationship actions by using the Coding Blocks. As he grows up and if he wants, he will take the knowledge and explore more complex forms of coding. It will be his choice, but based on playing with it and seeing if he likes it. Some parents at home might not have the chance or the resources to support their kids in experiencing code and that is why schools need to support it. I know Pernille is not suggesting dumping coding from schools, but I do think it is becoming more and more important that our students have more formalized instruction in coding so they can be prepared for the jobs that do not exist yet that will probably involve technology in a major way. What are your thoughts on coding in schools? 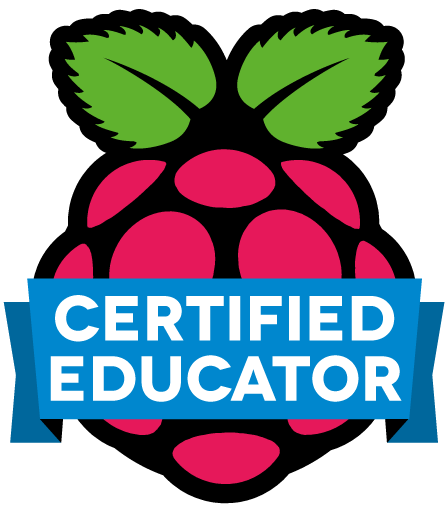 I have been loving all of the cool Raspberry Pi adventures I have gone on since becoming a Raspberry Pi Certified Educator. 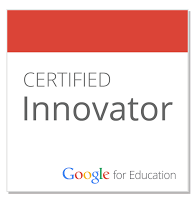 I have connected with even more amazing educators and have learned so much more about coding and computing than I have ever hoped. One of the cool things about Raspberry Pi is the community that surrounds this credit card sized device. It is an amazing group of people that love to code, hack, create, and share the cool things they are doing with Raspberry Pi. They organize events for people to get together and share their Pi creations and they have an awesome name, Raspberry Pi Jam. During the Picademy, the concept of Jams was explained and some of us immediately thought about doing one at ISTE 2016 in Denver. After some hard work and ISTE being awesome and donating space and monitors, I'm happy to announce the ISTE 2016 Pi Jam! All are welcome to come and check out the awesomeness that is Raspberry Pi. If you have no idea what Raspberry Pi is, but you want to talk to people who do, this is the place for you. The event takes place in the Posterboard Session space on Monday June 27 from 5PM-7PM. If you are looking to learn more, please stop by and say hello and see what is going on with Pi. If you are a Pi enthusiast and you have some awesome things you want to share with others, we would love to have you join us for the Pi Jam and share the awesomeness. Below is a Google Form for those of you who want to claim a space with a monitor to show your Pi work off and answer questions curious people might have. Again, this form is only for those who want to reserve a spot to show of their Pi projects. Feel free to spread the word and share the Raspberry Pi Jam love to everyone out there. I had seen MakeyMakey around the internet for a while, but had no idea what it really did. It just seemed like a bunch of wires connected to the computer and some bananas. Well, after playing with one this weekend, I realize why this is such an amazing tool for kids to lay and learn with. A photo posted by Nicholas Provenzano (@thenerdyteacher) on Apr 23, 2016 at 4:10pm PDT The packaging alone had Leo very excited to see what we could do. He was determine to make as many things as possible with the MakeyMakey. The first thing we had to do was grab some bananas. I asked Leo why we needed the bananas and he said it is because the pictures on the box showed the wires connected to the bananas. I can't argue with that logic. I easily plugged the usb into the computer and the MakeyMakey board and connected the wires to the correct spots based on the directions. Leo does not have the enough strength in his hands to open the clips just yet. Once everything was plugged in to the computer, we attached the wires to the bananas and opened the bongo page. Here is what we were able to create. Leo just loved playing on the bongos on the bananas. It just blew his mind and he immediately wanted to know what else we could connect to the wires. He ran to the fridge to see what he could grab. He is happy to report that Raspberries and cherry tomatoes also make for great bongos. You can check them out on my Instagram page. 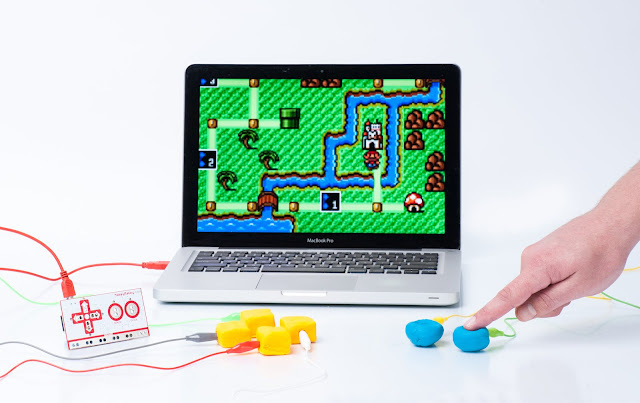 There is more to MakeyMakey than just bongo playing. The board allows you to do anything that requires the use of the directional pad and a mouse. On the back you can connect wires to act as letters on the keyboard. 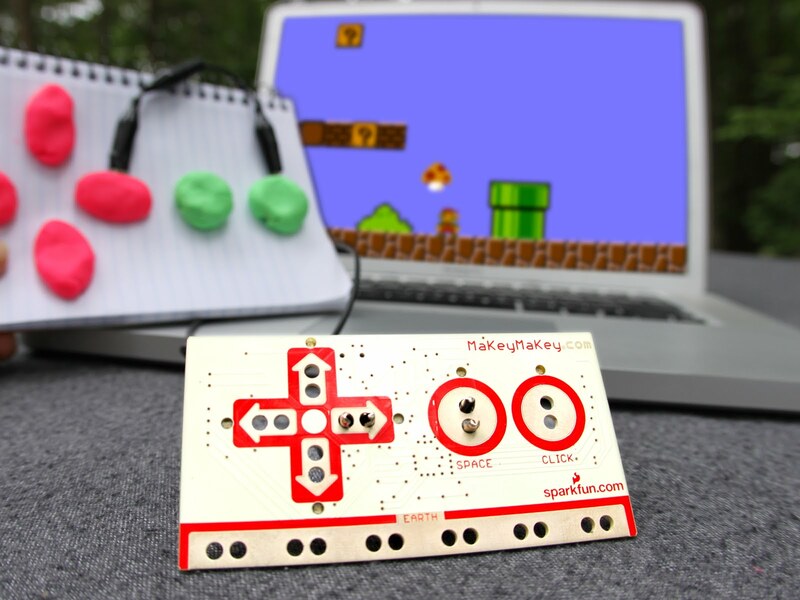 Any type of game play or personally created Scratch programs can be used with MakeyMakey. Here is Leo playing Canabalt on the computer using the MakeyMakey. I am always looking for different tools I can use in my home with Leo and with students in the Makerspace. The MakeyMakey kit is an amazing example of a flexible tool for Makerspaces. Since the board just processes the different types of input you set, it allows the user to create innumerable different projects that the MakeyMakey can support. Leo is always looking for different projects. As a young kid, his attention can move on very quickly. MakeyMakey allows him to pivot to a different project very quickly. We played for an hour straight before bed time and he can't wait to play with it again. You can buy your own MakeyMakey kit with the cool collector's tin right now! Hurry up, but these guys do not stay in stock for very long. For $59.95, it is a great deal on a portable Maker Kit that will spark the creative spirit in your children the minute they open the box. I will leave with my own little Piano Man playing on his very own penny keyboard. DonorsChoose.org is a charity that has funded over 700,000 classroom projects for teachers and has impacted over 18 million students across the country. Staples and Katy Perry are teaming up to help teachers enhance learning in countless classrooms by supporting their projects. Through their Staples for Students program, Staples today announced that it is donating $1 million to DonorsChoose.org. This is an incredible amount of money that is going to make a difference in classrooms across the country. According to the Education Market Association, 99.5% of teachers spend their own money on basic classroom supplies. This is not a surprising stat to educators. We are constantly stocking our classroom with necessities. It is frightening to know that some teachers are spending over $400 annually. I know I have spent lots of money on the classroom in the past on important items, but $400? The crazy thing is that these teachers are probably in high poverty areas and are buying basic school supplies that the children do not have at home. This is a reality education in the US faces. It is awesome that there are people and companies that do see the value of supporting teachers that are trying to make a difference in the classroom. I’m happy whenever any celebrity can help shine a light on the terrible funding issues educators face every single day. Education only seems to come up during an election cycle. When it does, it is important to let people know the real challenges that teachers face every day and it is great to see people step up and try to help solve these problems. To top everything off, Staples is offering a $50,000 scholarship to one lucky person who enters the ‘Staples for Students’ Sweepstakes. The cost of college is not getting any cheaper and anything that can help students avoid crazy student loan debt is a good thing. Details for entering the sweepstakes can be found below. If you find that you have some money you are looking to donate to a good cause, but you worry about how it will directly help people, check out DonorsChoose.org. The money goes directly to teachers in the classroom trying to make a difference for their students. It is hard to think of many other great ways to make a donation. Starting June 26, fans will have the opportunity to enter the ‘Staples for Students’ Sweepstakes for a chance to win a $50,000 scholarship. The grand prize winner – in addition to four lucky first prize winners and one guest each – will also win travel to Los Angeles, where they’ll attend an exclusive VIP Winners Celebration with Katy Perry. Learn more about Katy Perry teaming up with Staples to help teachers and classrooms at StaplesforStudents.org. I was going to start this post about how this is roughly the one year anniversary that I really dove into making. The thing is, that is true and false. It is one year since I got the Makerspace at my school finally up and running. 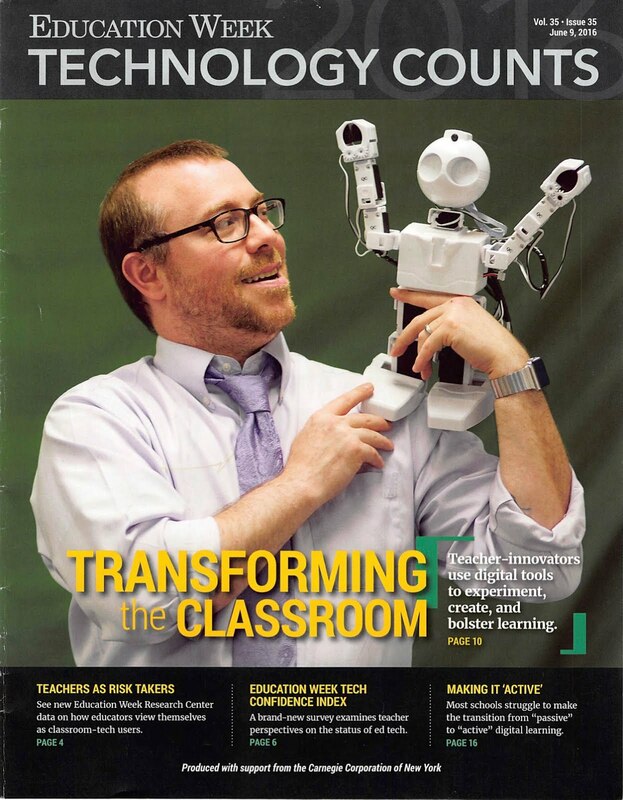 Since that time, I've worked on bringing new tools and ideas to the space and have worked hard to encourage students at my school and teachers around the country to embrace the Making. So, in that instance, it is true that this is an anniversary. However, it is not totally true. If I am honest, I have been making my entire life. I have always been a person that has loved to tinker and put things together. I have always come up with elaborate schemes to create new inventions since I was little. I have created gigantic wastelands for my Transformers to challenge Thundercats for supremacy of the bedroom. I have written short stories, I have daydreamed of different ways to engage my students with new and (hopefully) exciting lesson plans. These are things I have always done and that creative spirit is finally a more comfortable place to settle. I have had many different adventures over the past year with Making in Education, but I have a lifetime of experiences with Making in non-traditional settings. Actually, maybe Making at home is actually the traditional way to Make and Making in schools is truly non-traditional. That could be the issue. We need to make Making a normal part of the learning process. It should not be relegated to the basements of garages of homes alone. It needs to be brought into the light of the classroom where student from all backgrounds can explore the different ways their creative spirit can be used to Make amazing things. For teachers, it is important that we embrace an alternative way for students to express understanding of concepts and for students to explore complex ideas through explorations with Making. By becoming more open to Making and the Maker community, I have been able to view Project Based Learning with my students in a very different light and I feel like it has made me a better teacher for it. 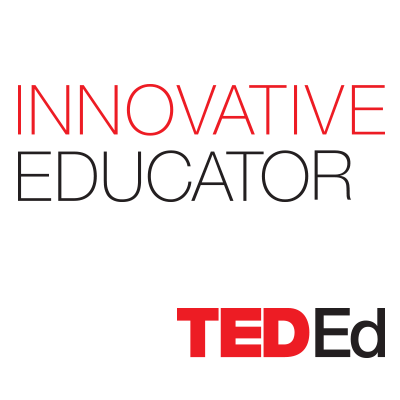 I think there is something important for all educators to learn from this and I love that I have a platform to share my Adventures in Making. I've started work on a Making book. This book is going to be for all of the teachers out there that think they do not understand Making, have no idea where to start, or just think that Making does not apply to their curriculum. This book is going to be filled with plenty of nerdy goodness. I'm excited to start my second book and share my Nerdy approach to Making with all of you. If you have specific topics you think I have to share, please leave ideas in the comments, send me a tweet, or drop me an email (onenerdyteacher@gmail.com). I can't wait to see what the future holds for me when it comes to Making, but I know that I will have a hand in creating it. I often reflect on the teacher I used to be, the teacher I am, and the teacher I want to be. People are often criticized for changing positions or beliefs. Change can be a scary thing, but it needs to be embraced. Not just cultural changes, but personal changes as well. I'm not the same teacher I was a year ago. Nor am I the same teacher from 2 or 3 or 10 years ago and that is a good thing. Being ok with change is not easy, but it is important in this ever changing world. We need to adapt to the new rules and guidelines that are being thrown are way. We need to change and adapt to the different types of students that enter our classroom. Not every year, but every day. Each student will enter carrying something new with them. We need to be ready for that. I love this quote because the Mad Hatter embraces change and says that he is not the same person just from earlier in the morning. Change is going to happen and it is ok to change beliefs if you learn something new. That might make you a very different teacher than the one who woke up today. If we want our students to be ok with change, we need to embrace it as well and this quote is a good reminder of that. I love Alice's response to the Mad Hatter. There are so many times that I have felt like the crazy person pushing PBL in other classes or the value of Makerspaces in schools. I wonder if I am the crazy person going in the wrong direction, but that is not always the case. 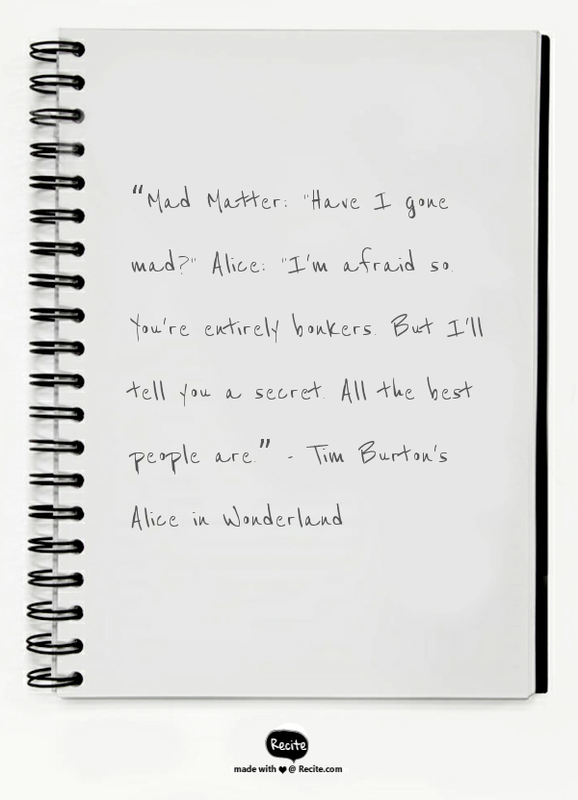 Sometimes I'm crazy, but maybe that is ok. Alice saying that "All the best people are" crazy is a good reminder that some of the greatest achievements in human history were because crazy people had mad ideas. We need to remind students that the crazy ideas can lead to the best solutions. 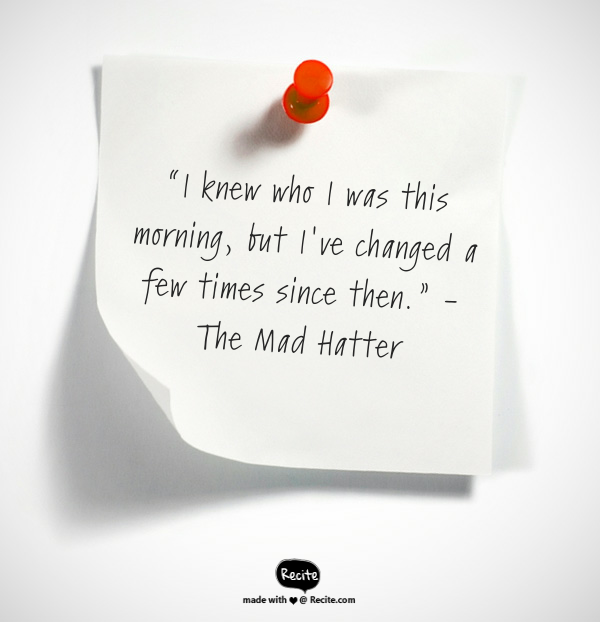 As we push critical thinking and problem solving to prepare our students for the world ahead of them, this quote is a wonderful reminder that some of the best creators, problem solvers, and thinkers were a bit "mad" themselves. We could all use a little madness in our lives. I want to share a helpful resource for teachers that focus on financial literacy. The Earn Your Future Digital Lab is an interactive curricula designed to empower young minds with financial and economic knowledge. “Earn Your Future” Digital Lab is a comprehensive financial literacy program designed for students in grades 3-12. Students engage with financial literacy concepts through innovative self-paced modules featuring custom videos, animations, and interactive activities. Educators are supported with embedded student assessment tools with real-time feedback, “Level Handbooks” and “Module Planning & Resource Guides.” The content is impactful, relatable, and aligned with Council for Economic Educators standards. This resource is free to use and very well put together. I played with it over a few days and actually had some myths about credit and other financial issues cleared up for me. Every teacher can sign up for free and create classes. Once there, teachers can create student accounts by typing in their name or by uploading a CSV File. Each student will get their own log in and password and this allows the teacher to track the work the student has accomplished. There are three levels for students to explore. Level 1 is for beginners, level 2 is intermediate, and level 3 is advanced. I decided to jump into the advanced level and really test my knowledge. I chose the first level and it was about Credit. There was a pretest, two videos, and multiple activities to walk me through how credit woks, what it is, and how certain things can and cannot impact credit scores. Best of all, I was able to do all of this on my iPhone! This is great for classes where students can use their own devices. The app allows students earn badges as they complete more of the self-paced content. It is a great for students to show that they have accomplished their work and the teacher can see how far the students have come along. Teachers do not need to feel like they are heading into this in the dark. There are great Educator Guides that can help teachers implement this application into their regular schedule. The PwCCharitable Foundation has created a great resource for grades 3-12 that helps students learn valuable skills as they move forward in life. Too many kids get hit with credit card debt and face confusion over other aspects of financial literacy, it's great to see something that helps students and teachers get a better understanding of very complex ideas. Currently, there are interactive modules for middle and high school students, with elementary modules coming in the fall. The PwC Charitable Foundation supports the people of PricewaterhouseCoopers in times of need and invests in emerging solutions to society’s greatest challenges in education and humanitarianism. Feel free to run through the lessons yourself and see what you still have to learn about financial literacy.